A look back at some of our adventures of the past weeks/months. 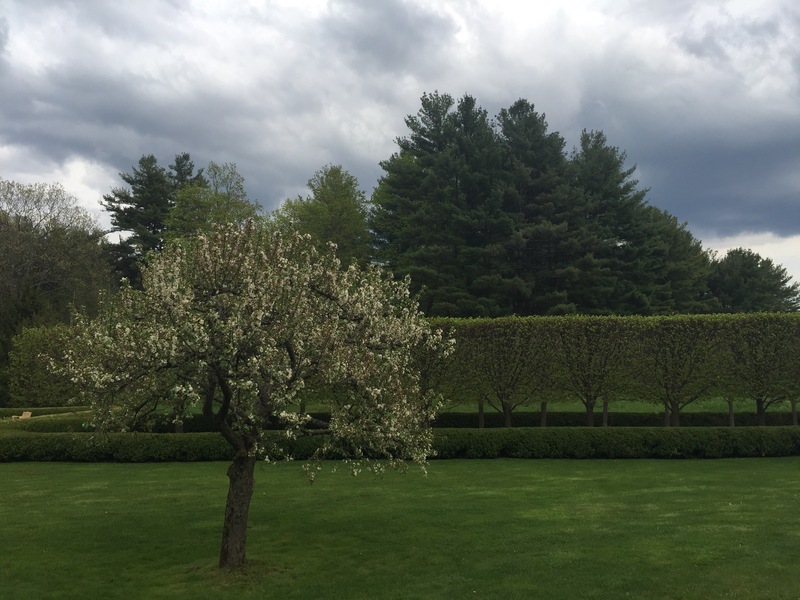 After spending some quality family and friend time in Boston in early May, we headed west toward the Berkshires. 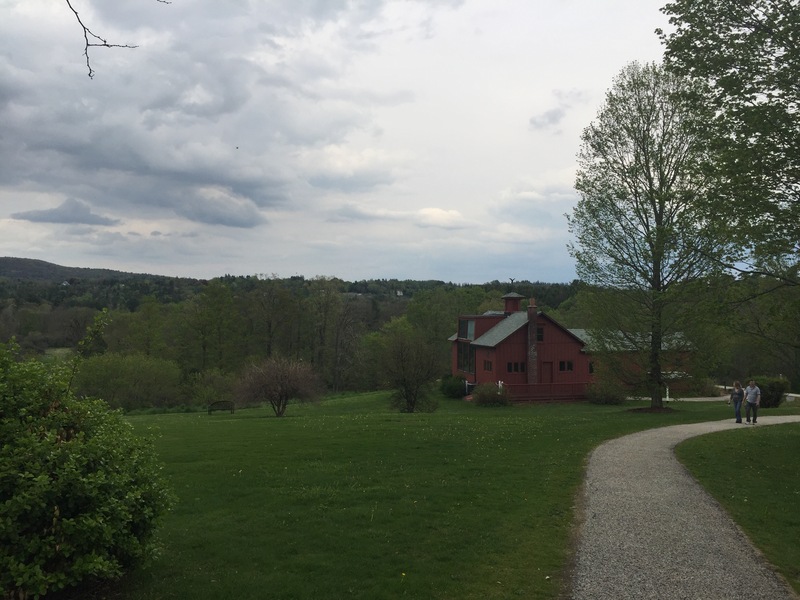 The Berkshires is one of those east coast places (like Poconos, Adirondacks, Smokeys) that was tantalizingly close, but not close enough, so they remained unexplored, but always made me long for more vacation days. Time to get there, time to kick back and enjoy the natural beauty, and more time to see what there is to see, time to see what you didn’t know there was to see until you got there. Time, time, time. The bounty of this trip. 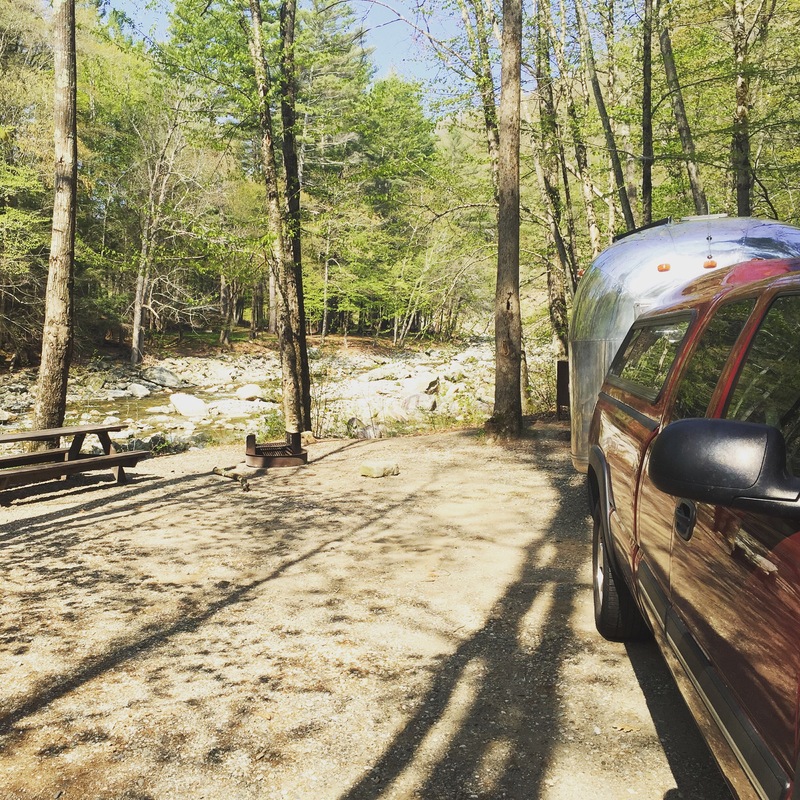 It being so early in the season, it was easy enough to pick our spot using the state’s list of campground opening dates: Mohawk Trail State Forest it was. The drive there was lovely – even some tempting places to stop for supplies along the way. 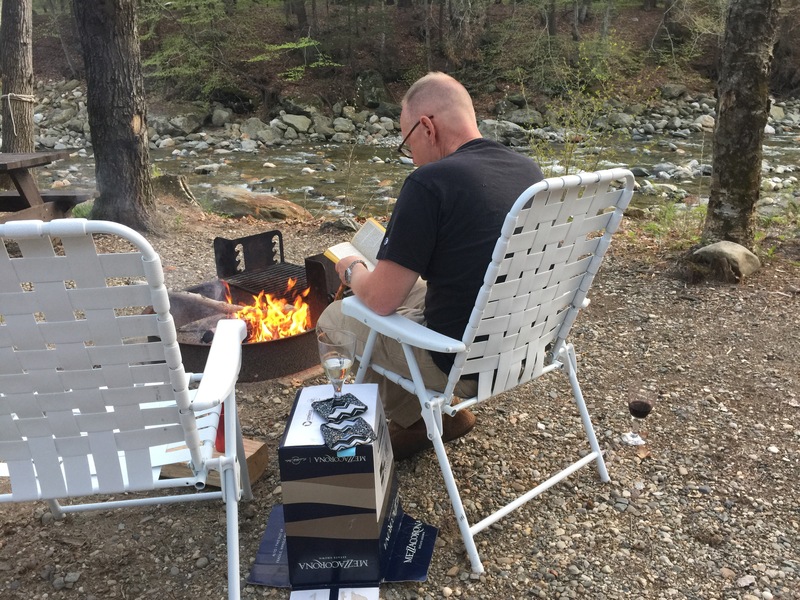 We settled into our spot on the Deerfield River and even set up the hammock and had a few campfires (#4 and #5 of nine months on the road, I believe). There is little to no AT&T cell service here – I did a very small part of a very steep hike adjacent to the campground, and got a little more. More importantly on that hike – I truly felt it was spring for the first time. This was our first nature nature stop since Acadia a few weeks prior – where it snowed! I’m not much at identifying flora and fauna but what really blew me away was the BIRDS, chirping like no one was listening. But me. It was musical and heart lightening. 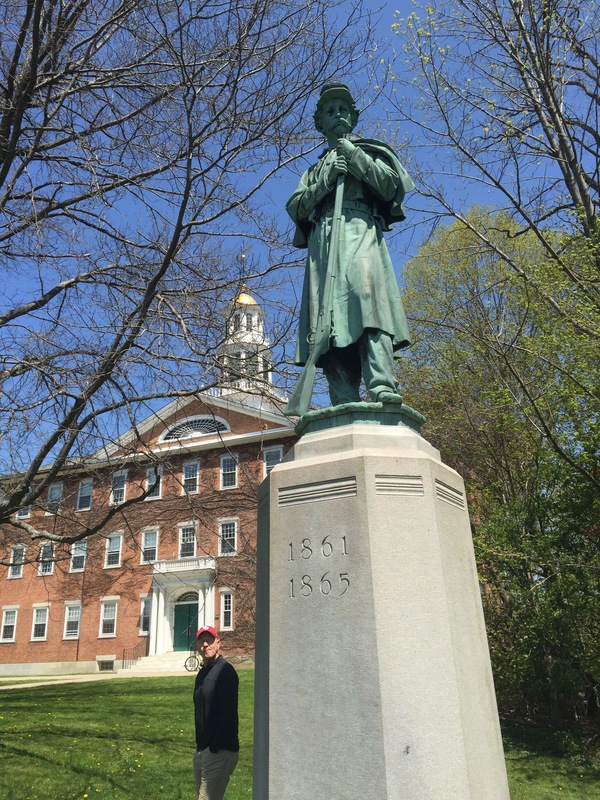 Exploring the next day, we checked out Williams College. Now, I am a Wesleyan Alum and have some very bitter memories of finishing second to Williams in sporting events throughout college, including in my own sport of rowing. There was a Tshirt for sale extolling the nature of the “Little Three” rivalry calling it the “good, the bad & the ugly”. Wesleyan was the bad. Amberst, the ugly. So, I guess it could have been worse. But it was pretty easy to put all that behind me and enjoy the beautiful day on campus (the students clearly were). 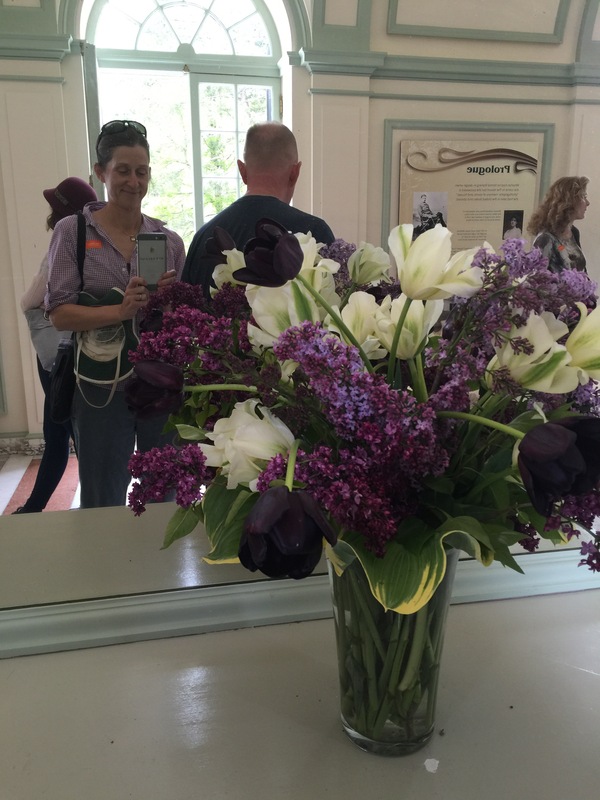 There is a great museum there – The Clark – which we skipped this time because it just wasn’t a museum kind of day. On the list for next time. 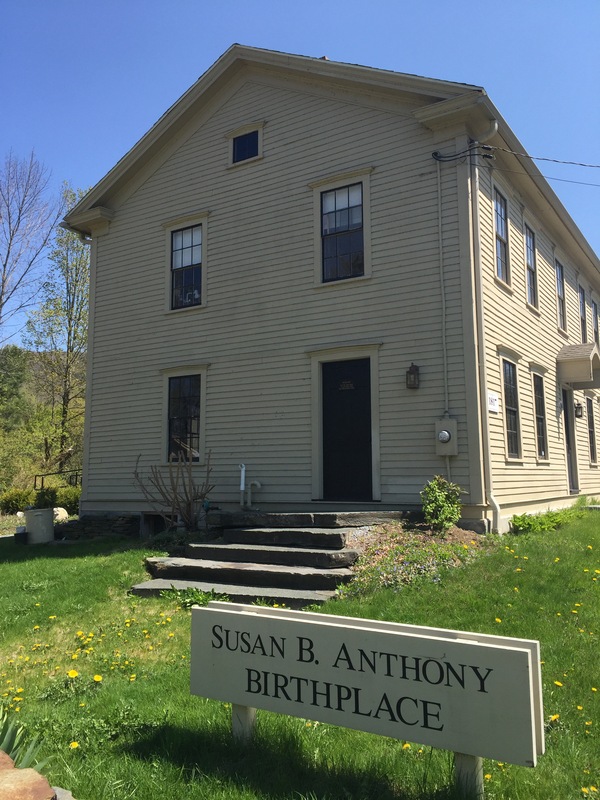 Continuing our drive, we stopped by the Susan B. Anthony birthplace (b. 1820) in Adams. 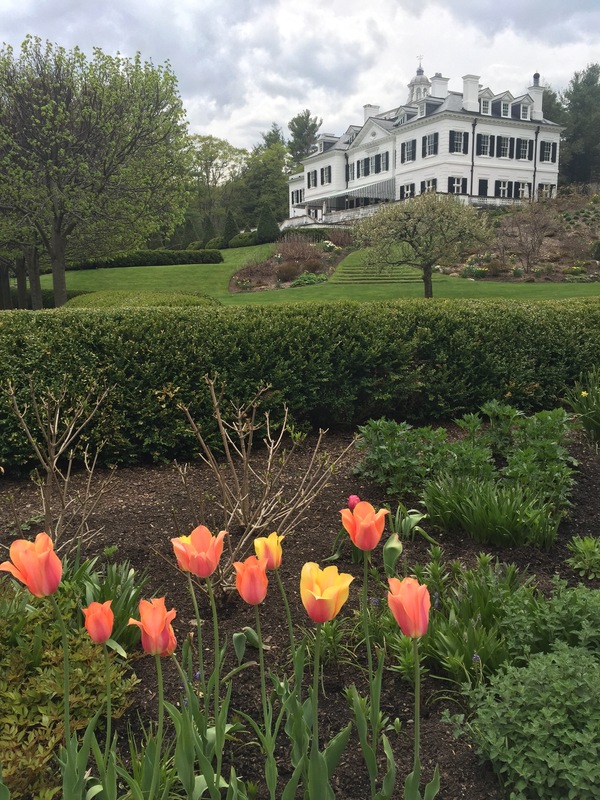 Though still closed for the season, we poked around outside, imagining Susan (she probably would have been doing something more industrious) and her Quaker upbringing, her familiy’s commitment to abolition, which led her to temperance and women’s suffrage. She’d probably be amazed to know it’s taken us this long to (almost) get a woman at the head of a major party presidential ticket. She’d probably be amazed at some other things about this year’s campaign, but I digress. After a few days, we ventured south and took advantage of WBCCI member courtesy parking (for the first time) at in Pittsfield. WBCCI is a membership organization for Airstream owners, and named for Wally Byam, the founder. The Antenellis couldn’t have been more hospitable-they shared their homemade wine and grappa and gave us a trivet and an iron! They have spent a lifetime traveling, are avid skiers, and gave us great tips on the area. They said in the forty plus years they have offered courtesy parking, only a few had taken advantage. 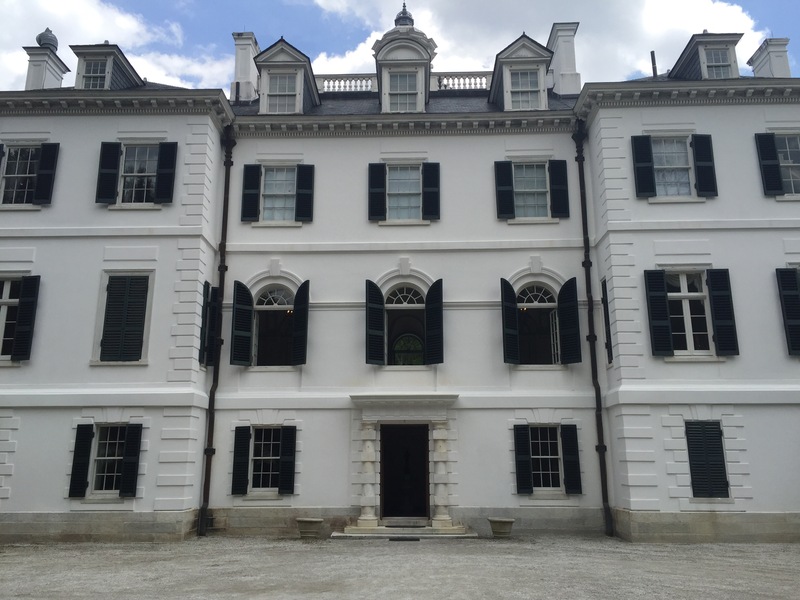 My #1 reason for wanting to stage in this area was to visit Lenox, and the home of author Edith Wharton. 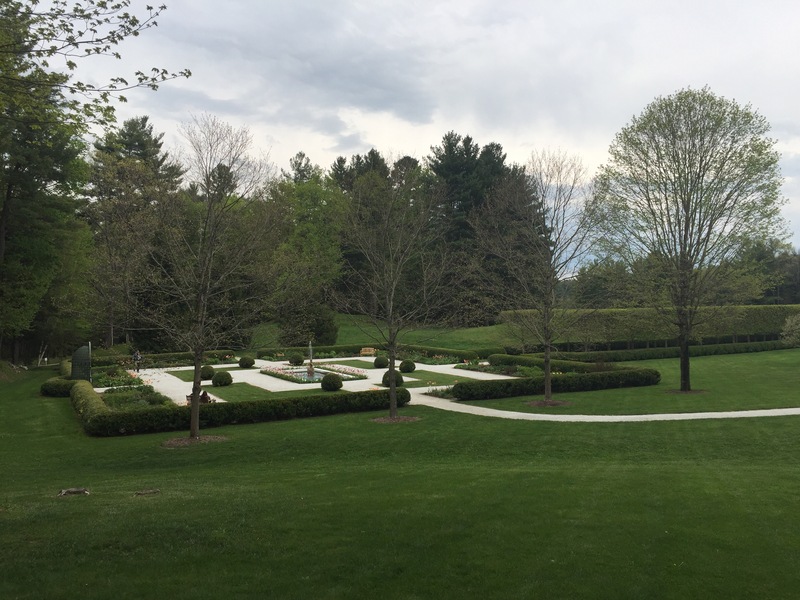 (It is near Tanglewood, the outdoor music venue.) I’d always wanted to visit – but it was just one of those places that felt maybe too remote to build a trip around. It was the very first day of their season. It did not disappoint – go go go! 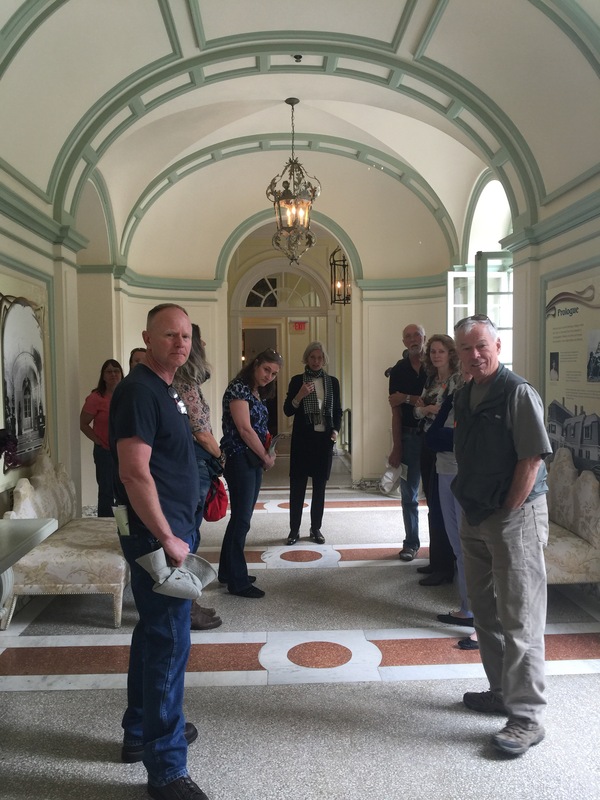 Though they give guided tours on the hour, you can more or less roam at your leisure, soaking it all in, reading exhibit panels, and even dining on the porch with food from their cafe. She designed and built this home in 1901 – an extension of her early success as co-author of a best selling design book. She inherited some money and was starting to to earn more with her fiction. So she built The Mount-first the house and then the gardens. Within 10 years, her marriage was falling apart, and she found being a divorced, successful writer was not tenable in America, so she sold the house and moved to Europe where she continued to write (forty books in forty years, first female Pulitzer Prize for fiction winner) and led humanitarian work during World War I. In the meantime, the house passed hands – it was a part of some schools, then housing for a local Shakespeare group. 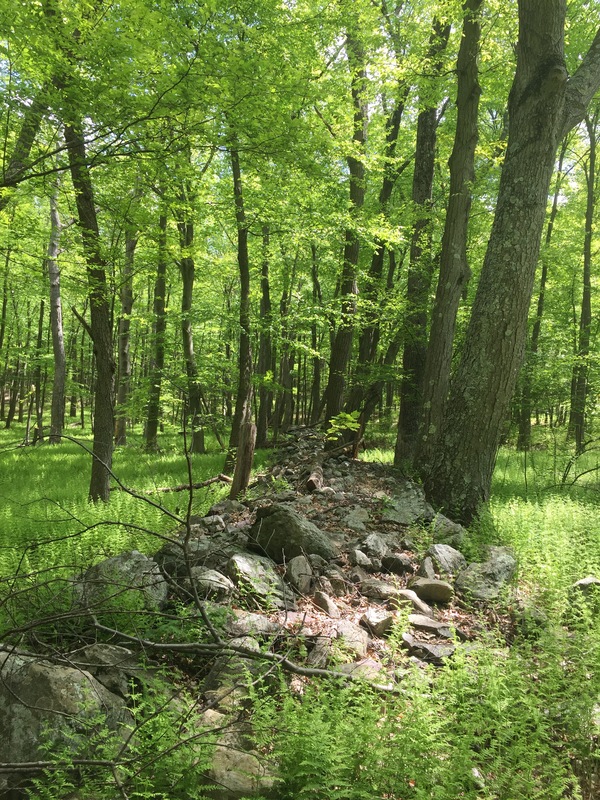 A group formed to save it, and with the help of many, it has been saved and restored. 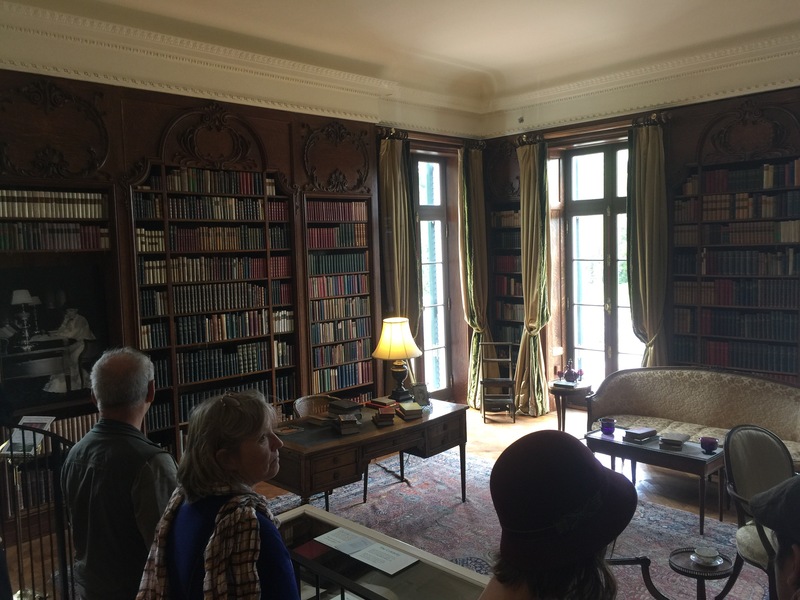 There are few original furnishings, but they did recently reacquire her books, which are on display now and in the picture below. The picture above is in her bedroom – where she did her writing every morning. She would write the pages in longhand and her secretary would pick them up and type them. If I recall, those are portraits of her father and brothers on the wall. 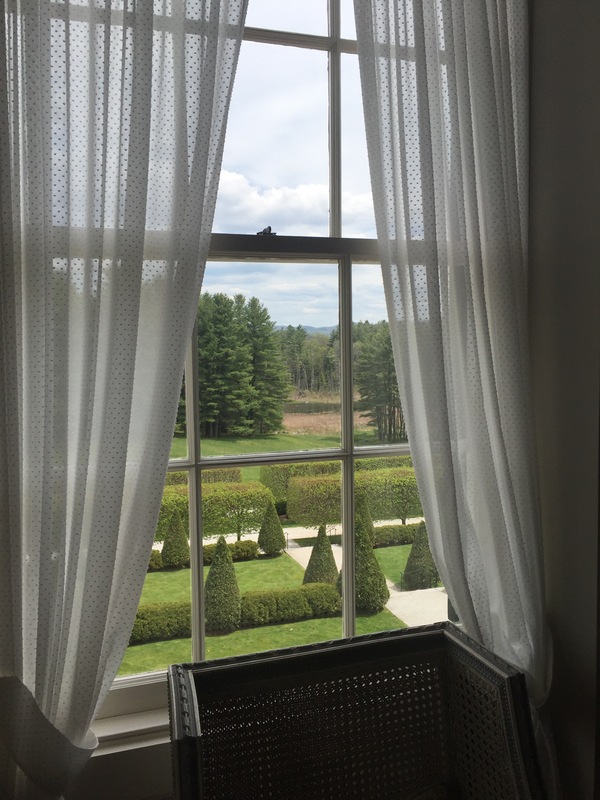 She looked out onto her gardens, which only recently have been restored at great cost. Her niece helped with the design, and she meant for them to be architectural, like the house. She used only three colors (outside the flower garden) and I heartily approved. They were stunningly beautiful, and it was just the beginning of spring. I could get teary just thinking about this place – that a woman at that time could have artistic vision and not let it be thwarted. True, she was born into money, but she made her own life. Was able to see her passions through to fruition – and we can still experience it today. 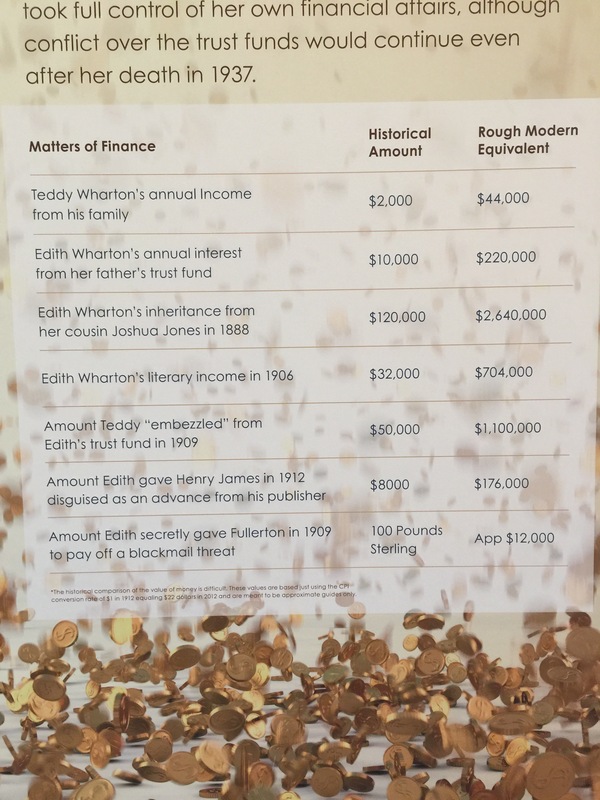 I loved this exhibit panel about her finances. Edith and her husband were great animal lovers, especially of little dogs. (They would be very at home in the RV world.) 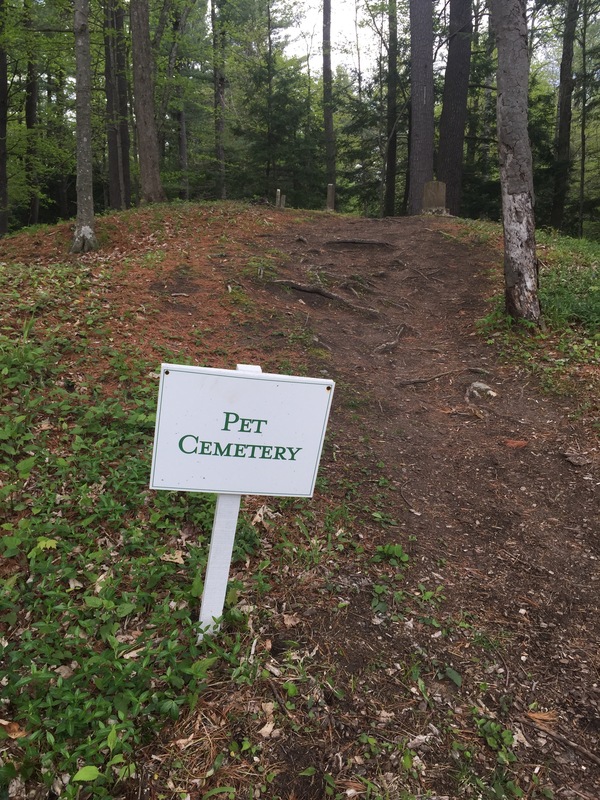 A stop at the pet cemetery was a nice way to end our visit. There are tombstones with endearments that show the depth of their love for animals. Though we did not have time to visit, we did pop by the Normal Rockwell museum down the road in Stockbridge. We looked in the gift store and I snuck this picture of his studio and view. Wish we had more – TIME! Never enough. 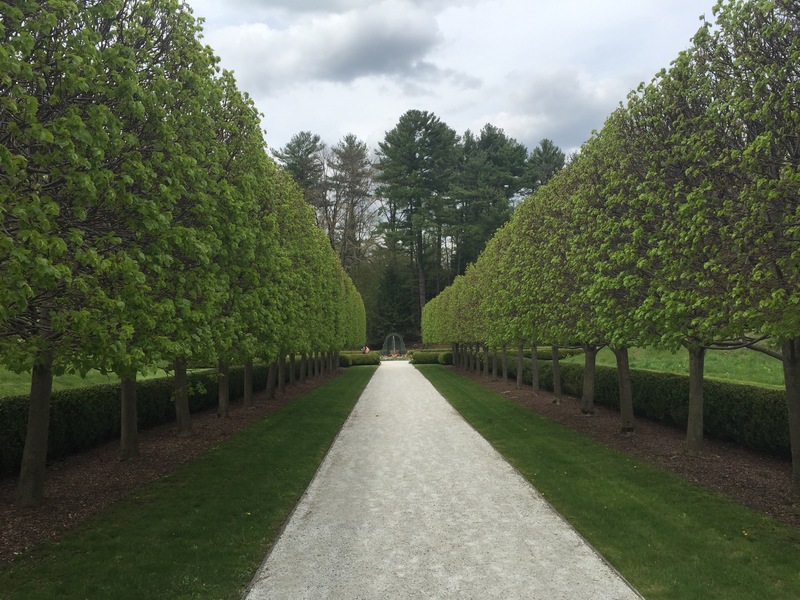 Berkshires, you were worth a visit. Backtracking a bit to share about some of our adventures in the last weeks/months. The third weekend of May, I had a lunch date in Pennsylvania with some high school classmates (having missed our reunion in LA). So we had to kill a little time between there and the Berkshires and were craving more nature. Scouring the map, the solution could not have been more obvious: New Jersey. 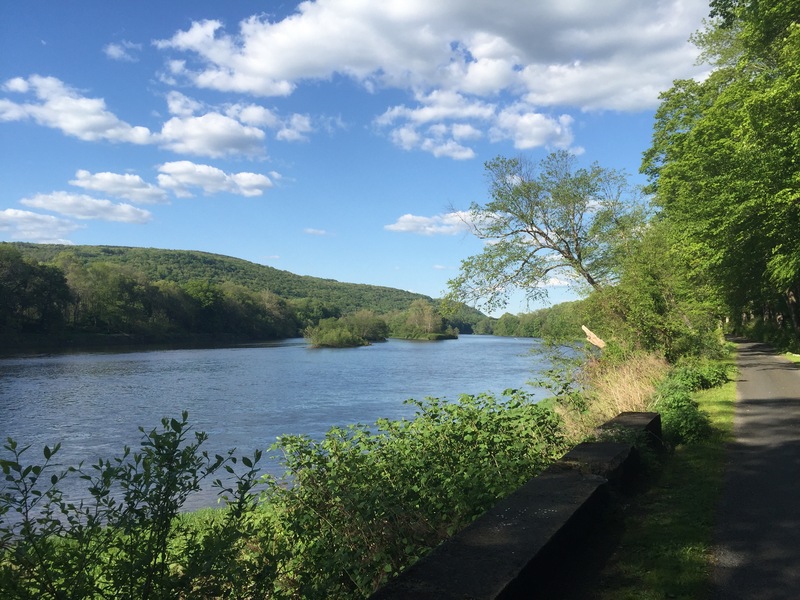 The Delaware Water Gap National Recreation Area between Pennsylvania and New Jersey is just lovely. 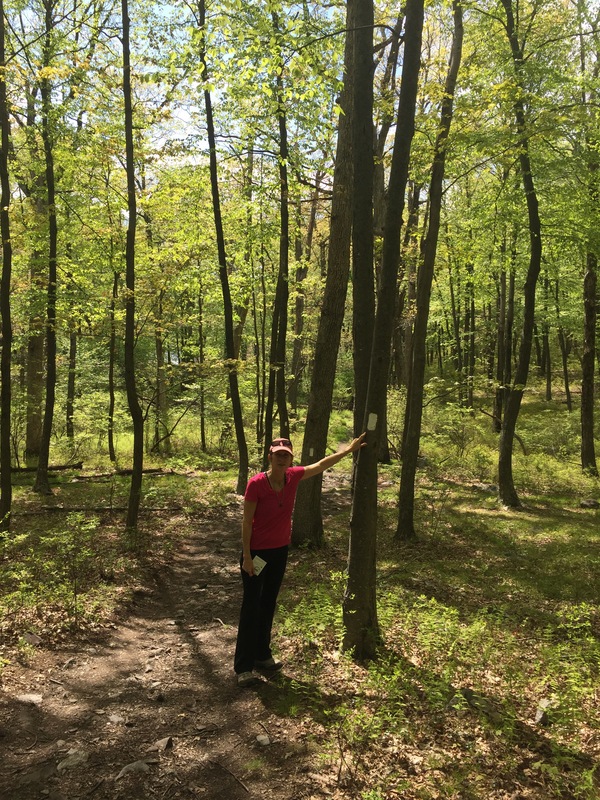 Rivers, streams, ponds, mountains, valleys, tree canopies, fields of ferns, bevvys of birds–and if you are there on a weekday before Memorial Day, sparsely populated by humans. 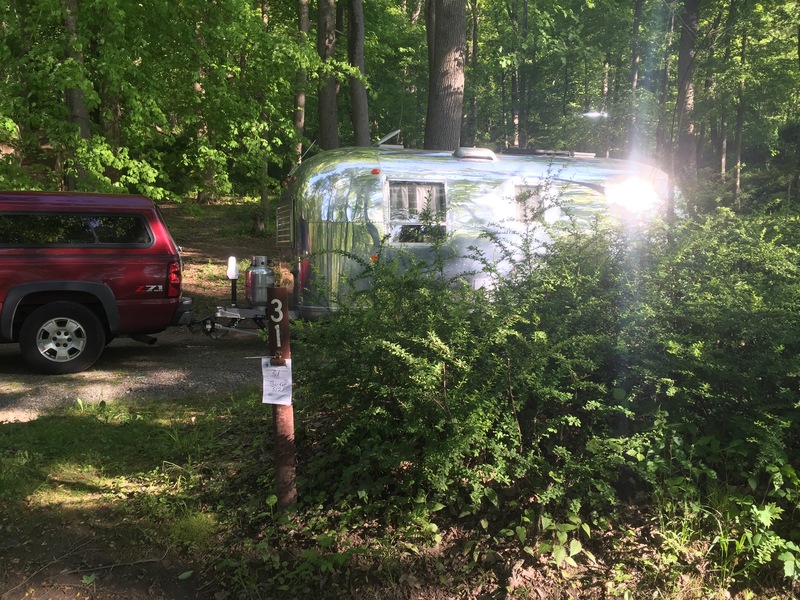 We settled on Worthington State Forest, because nothing beats a riverside campsite (Delaware River in this case) and though the one Campendium review warned of some potholes and bears, we ventured on. It was tricky to get to from the highway (a one lane road for part) and we had to proceed cautiously to and in the campground because of potholes. But the river beckoned and we persevered. We wiggled back into a site in the woods (there are many more further down the road in an open grassy field), eyes out for bears. Our BIG activity was the 6 or so mile round trip hike (loop-yay!) 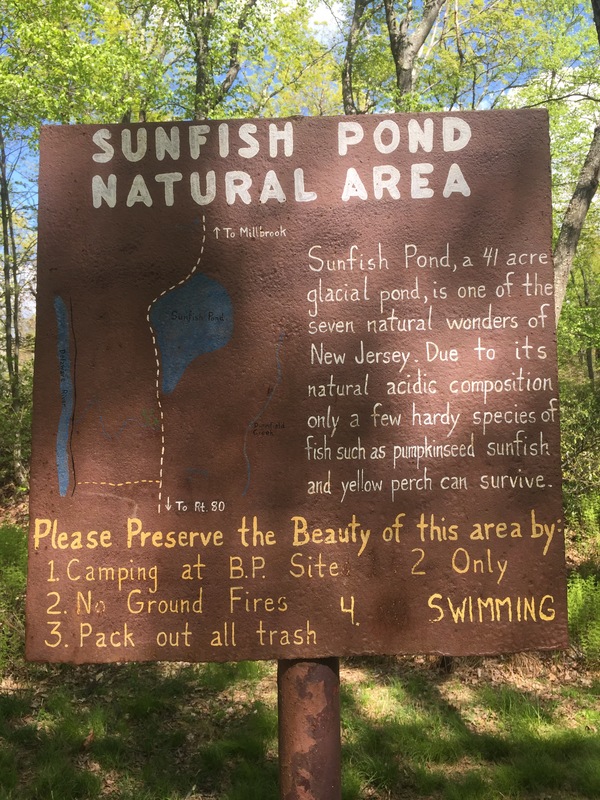 to Sunfish Pond. You can walk to the trail head from the campground (yay!) 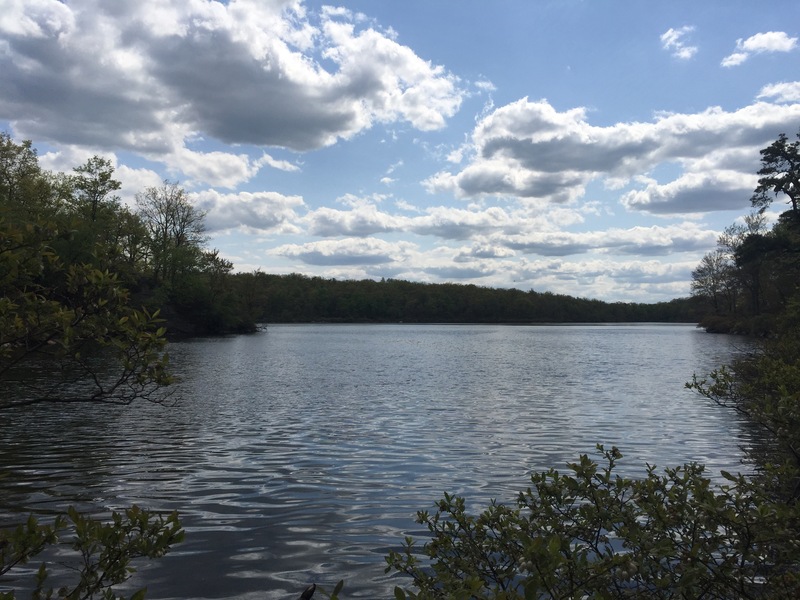 As you probably already know, this special place is one of the seven natural wonders of New Jersey. It was picturesque, at the top of a just strenuous enough ascent. The Appalaichan Trial runs alongside for a bit and it was cool to follow the white hash marks and imagine going for a really long walk in the woods. We crossed paths with some thru hikers – young guys with all their gear and lumberjack shirts fresh out of a J Crew ad shoot. I was too toungue tied to ask them any questions (dumb) so instead I told them a thing or two, e.g., “We just saw a snake!” True. It slithered out of the bushes (what’s that sound?) and crossed right in front of us on its way to the pond. Try to find it among the sticks below. I screamed a little and wanted to make sure those fellas didn’t. 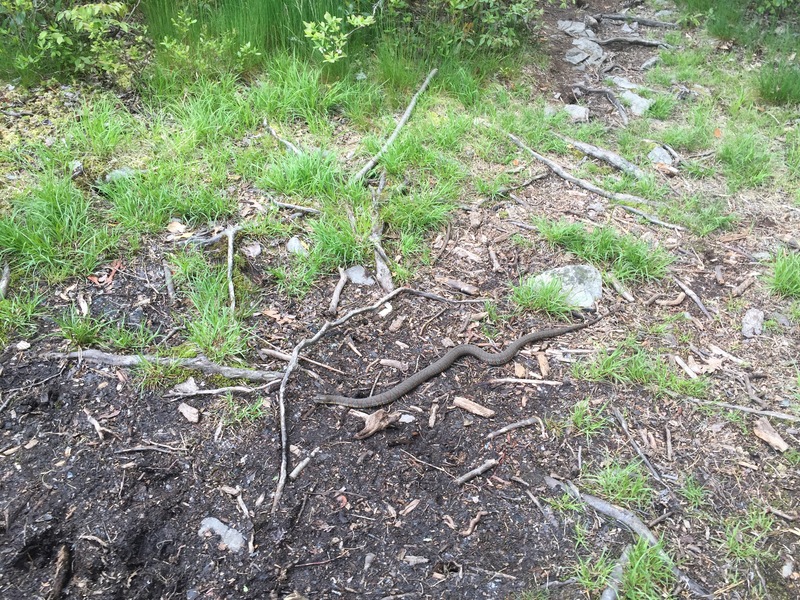 No worries, they said: “Oh we just saw about four snakes back there, the way you are headed now.” Great. We didn’t see any more snakes, but we did see dozens of middle schoolers spreading out their tents in an open field, getting set for a night of fun, probably celebrating the end of the school year. We blessed their chaperones and proceeded back to our campsite. Some more scenes from the hike below. The next morning on the way out, those potholes got us. A pinhole size crack in the trailer wheel gave us a flat tire. 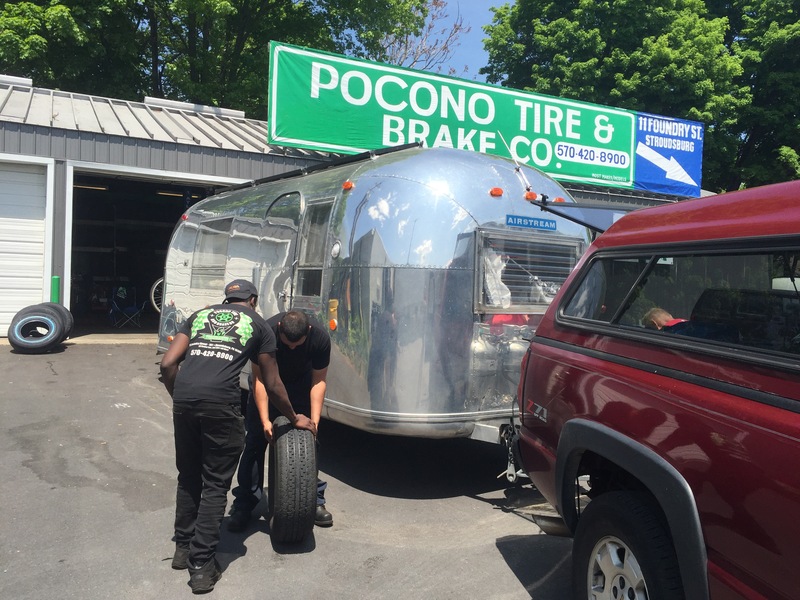 The fellas at Poconos Tire in Stroudsburg, PA helped us diagnose it but the spare got us back home where a new wheel from Vintage Trailer Supply would await. We found a cool little RV park to stay at right on the Arkansas River. It happened to be adjacent to a rowing boathouse; very welcoming to be bunking down near all those pretty racing shells. Not a beauty shot, but wanted to get the RV Park and the Rowing Club in the same shot! However, there would be no rowing, just history stuff for us on this fairly cold and rainy February weekend. The RV park is right across the river from the Clinton Library, and there is a pedestrian bridge (see pictures above and below) you can walk across to get to it. Clinton’s life story and his rise to the stop is a pretty amazing. His father died before he was born. His mom put it into another gear, left young Billy with his grandparents while she went away to nursing school. That had to have been TOUGH. His grandparents lived in Hot Springs (about an hour from Little Rock) and owned a little market that (unusual for its time) served black and white alike. The Library did a good job of linking Clinton’s personal experience growing up in the same decade as Brown vs. Board and in the same place/region as the very public battle over integration at Central High School in Little Rock. His grandparents get credit for lighting his passion for civil rights. So the museum also has a cabinet room, and an oval office and presidential limo. The bulk of the exhibits organize his accomplishments by policy area, and there is a separate timeline display as well. The timeline is presented down the middle, with the alcoves on each side presenting material by policy area. The design of the space was modeled after Trinity College Library in Dublin. The timeline is presented down the middle, with the alcoves on each side presenting material by policy area. So, here is how they treated the Impeachment. I can only imagine the painstaking word for word drafting and editing that was done. For those who forget, are too young and/or don’t have your pocket Constitution handy, Impeachment is a two step process: first, the House votes one way or the other. Then, the Senate has a trial – for real – Chief Justice Rehnquist presided and the Senate was the jury. How did we maintain our energy with so much to look at and learn about? That morning, we brunched at Skinny Js – I think we could have easily walked there from our park to the funky little main street of North Little Rock. I highly recommend the Louisiana Omelette, and for sure get the biscuit. Park in the lot behind the restaurant so you can see the amazing mural below. The next day, Ben and I headed over to Little Rock Central High School. STILL a working high school after all it has been through. It is a National Historic Site – complete with a Visitors Center and they even give tours (sign up in advance) that take you into the high school. But for me, just being out on the sidewalk was enough. Right here, in 1957, first the national guard, then the Little Rock Police and finally the 101st Airborne offered varying degrees of “protection” to the students and the community (and the press!) from those who opposed integration, including, most significantly, the state’s governor, Orval Faubus. (An elected office also held by Bill Clinton.) Standing out on the street today, looking toward that majestic building, you cannot but help feel awe, admiration, and gratitude for the Little Rock Nine and their families and supporters. The building itself is massive and gorgeous – a mix of art deco and gothic styles. The Visitors Center did a nice job of contextualizing the events in history, focusing on the rule of law, and especially the balance of power between the federal and state governments. The exhibits detailed the Constitution’s treatment of slavery, Reconstruction, Jim Crow and the careful, methodical work of the NAACP which lead to the Supreme Court’s 1954 Brown decision, mandating that schools integrate with “all deliberate speed”. Just a tad vague, right? This touched off the crisis in Little Rock. Central High School was – at the time – the “white” high school, the best high school in the district because it had the best resources, most class offerings and activities for students. After Brown, the NAACP petitioned the Little Rock school board to integrate. Slowly, the school board moved forward – slowly. And, as they say, all hell broke loose. This view above, from the Visitors Center, shows the gas station, on the left, which had the only pay phone in 1957. So that’s where all reporters went to file their stories. It’s part of the historic site. Once the nine were finally escorted safely inside by the 101st Airborne (three weeks after the image above and what should have been their first day of school), the struggle did not end. Oh, what a difficult year they had. Though the artifacts below on the right are tough to look at, it’s not enough to say “they faced prejudice” – it’s important to SEE. We owe our thanks to those involved in integration struggles, as well as the caretakers of the history, like the National Park Service, to make sure we see for ourselves. In the spring, the only senior in the group, Ernest Green, graduated. But, what happened next, I did not know: the four high schools in Little Rock closed the following year, as a result of ongoing resistance to integration. Closed. What a story-just makes you want to know more, right? Both Ben and I were shocked but amused to read in a gift shop book: despite the schools being closed: “Strangely, the football programs continued.” Ah, America. So much more to learn. In the Clinton Library, an exhibit shares the president’s pleasure, years later, in holding the school doors open for the Little Rock Nine during an anniversary commemoration, as well as hosting them in the very same governor’s mansion where Faubus plotted against them. Pretty cool to see how history runs through and across a particular place in our country. On the way out of town, we stopped for a photo op at The Old Mill at T.R. Pugh Memorial Park in North Little Rock. This “find” was my reward for perusing the local tourism brochure rack in the RV Park-would have never known about it otherwise. The Old Mill was featured in the opening credits from Gone With the Wind. Apparently it’s the only building left from the filming (blink and you’ll miss it). It isn’t actually a mill (more like an old fake mill), but it IS old, and picturesque. I recognize the irony of a blog post mostly about civil rights in the south ending with a nod to a book and film that perpetuates the lost cause mythology, but it’s all connected, right? Very grateful for the chance to explore and learn. The just announced discovery of the sound of black holes colliding a billion light years away has us, once again, in awe of scientists (and engineers and the other people who made this happen). Just like we felt on our visit a bit ago to The Very Large Array in New Mexico- oh if civilization had to depend on the meager thoughts and ideas that come out of our kitty brains, we’d be in trouble. Thank goodness for smart people! The Array is comprised of 27 giant antennas detecting radio waves from space, spread out for miles (hence the name) over a high (no radio interference), but flat expanse southwest of Albuquerque. I think I have got this right – our eyes, binoculars and telescopes detect light on the visible spectrum. But these babies, radio antennas, detect light not visible, way on the other end of the light spectrum. All of the antennas are synced together so their data can be combined to form higher resolution images – that we can see! (example below, right) of objects in space. The dishes are moved every few months into one of four configurations – depending on what exactly they are hoping to detect. But, don’t trust me: go to the source for a more thorough explanation about how they work. We arrived late in the day (as is our wont) and the personable and welcoming staffer in the gift shop let us linger, shopping, and answering all of our questions. Though she herself was not an expert on the science, she had a really neat personal connection to the Array, which she shared. Her parents ram a motel in the small town of Magdalena – about 25 miles away – where all of the workers building the Array in the 70s lived. The town was so small, there weren’t many places to eat, so her family, in order to keep her hotel business bustling, agreed to provide meals as well. So for four years straight (during the length of the construction) she served breakfast and dinner in three shifts to the workers. There is a thoughtfully presented self-guided walking tour, outside, with stations where you can learn a bit as you go, culminating in a chance to go right up to one of the dishes and pose for a picture that tries to convey their size (82 feet in diameter). They do a guided tour the first Saturday of every month. Because they were in the midst of switching from one configuration to another (which they do quite carefully on transporters which glide and turn as needed, gracefully as ballerinas, on double train tracks (seen very clearly on the picture at the very top) we got to see a transporter (orange below) poised for action. 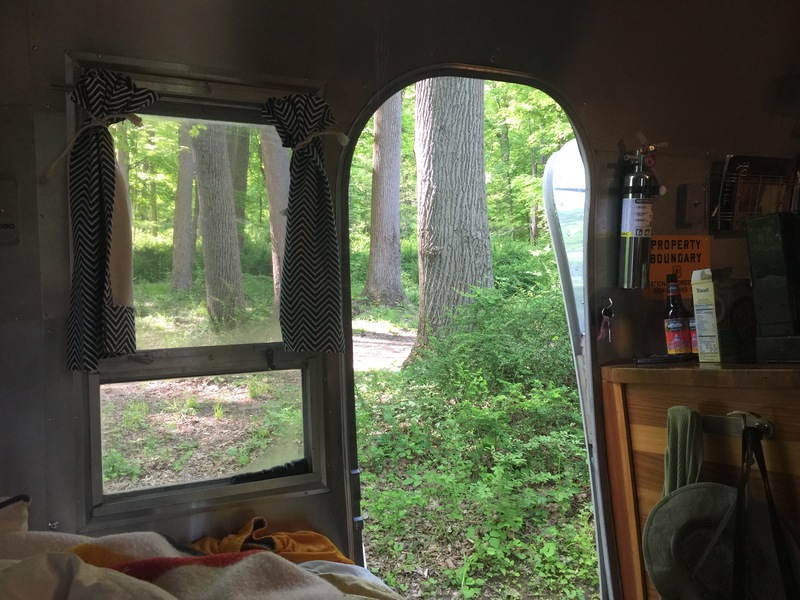 We split our visit over two days – spending the night at the nearby BLM Datil Well Campground. We were kicking ourselves for not buying Contact, because with no cell service at all, we resorted to watching one of the DVDs in our small collection – Bridget Jones Diary – which has nothing to do with space exploration, and is just the kind of mindless fodder our kitty brains enjoy as a break from so much thinking and learning. But there is a lovely scene in the snow at the end, which portended what we woke up to – by far the most snow we’ve ever been in with the Airstream. Luckily the road out of Datil was not too steep, and we went back to the Array to finish up our tour; it cooperated with lovely pictures, despite the very very cold temps and wind. So while the folks at the Array may not be getting the credit this news cycle, their press release section can give you a sense of their amazing discoveries. My favorite? The discovery of water ice on Mercury, the planet closest to the sun. We did manage, once we got back to the land of cell service, to stream Contact (fair warning: Matthew McConaughey is in it too) and, though it felt a little dated, we enjoyed it very much. Even with (or perhaps because of) all the news lately, if you still aren’t quite feeling the excitement about how space exploration can impact humans, its closing scenes will take you there. As winter approached, we headed south. Outside of Tucson, we chose the highly recommended Gilbert Ray Campground as basecamp for a visit to Saguaro National Park. Airstream tucked in at Gilbert Ray Campground, near the Tuscan Mountain District (western) part of Saguaro National Park. We were both quite taken with this desert, this National Park. All credit goes to Bob, a retired scientist (spent most of his career at the nearby and highly regarded Arizona Sonora Desert Museum) who now volunteers as guide on nature walks in the park. You know how some ranger talks are better than others? It felt like Bob gave us the keys to the desert – slowly, carefully teaching us about the various plants, one at a time. He explained how they worked together, and how by looking closely, they’d reveal even more about their desert existence, and help you make sense of the place. Our hero: Bob. In his hiking pack, he carries, among other things, a comb, in case he or a visitor gets stuck by a jumping cholla (choy-a) cactus ball. Also, a camera, because as long as he’s been out in the desert, there are still some things he hasn’t seen (e.g. certain kind of scorpions) and would like to. Though the natural focus of the park is the saguaro (pronounced sa – WAH – ro), the iconic Arizona cactus, most often depicted with a few arms lofted to the sky, Bob taught us about other cactus: cholla (teddybear, jumping and staghorn), prickly pear, fish hook barrel. And their non cacti friends: palo verde, ocotillo, mistletoe, ironwood, mesquite, sage. In this picture, one can see palo verde, saguaro, cholla, and prickly pear. Probably a lot more. After getting schooled by Bob, we were able to go out and find our own saguaro cacti. On the left, is a younger saguaro, maybe about my age. 🙂 The one I’m gazing up at could be 200 years old. We wanted to check out nearby Kitt Peak National Observatory. It was a bit snowy (Arizona?) so we weren’t able to see any of the telescopes (the paths to them were treacherous), but kicked around the visitors center and had a nice chat with an astronomer visiting from University of Indiana about his work. We would definitely recommend a visit, and a check on the weather at 7,000 feet before you go. We scratched our astronomy itch instead at a program that the folks at Kitt Peak sponsored, but held in the parking lot of the visitors center back at Saguaro: a night-time Binoculars Stargazing program. Ben and I ended up being the only attendees, so we got a lesson on how to use a star map, tips on using our binoculars effectively, and a personal tour of the night skies. Our guide also gave us resource recommendations for future exploration: download the (free) monthly star guide from SkyMaps.com for a map showing where the starts will be. He also recommended a book for newbie skygazers, young and old: The Monthly Sky Guide, which Santa brought to Ben for Christmas. -There are only 88 constellations in the sky – and they are entirely human creations. -The North Star – what we know as Polaris – changes. It’s not always Polaris. It’s whatever (bright) star is closest to being directly overhead if you are standing on the earth’s north pole. But Polaris’s position relative to the North Pole is slowly drifting, so eventually (500 years or so) Polaris will no longer serve that role. -Stars with a blue tint are actually hotter than those with a red tint. -Ever wonder why your particular astrological sign is in a particular month? Nope, it’s not because you can see your birth month constellation during your birth month. During your birth month, the sun is passing through your constellation, so you can’t see it in the night sky. Arizona, and Cactus League Spring Training. We saw the excellent movie Spotlight, and had Korean food at Kimchi Time where I had the very odd but kind of cool experience of having one of the waitresses walk right up to me and say “You look just like my mom! You even dress like her!” Now, as a non-mom, this was a little strange to hear, and most of my friends’ kids aren’t quite as old as this young woman, so that was a little disconcerting. (Plus, what about the “you dress like her” comment?) But she was so sweet, we took pictures together, found some more things in common and are now following each other on IG. On another personal note, we spent a lot of our time in this spot worrying about one of our kitties, who had/has a health scare, but seems to be doing ok now in the hands of his loving DC family: Laura, Mark, Logan and Finn. But do keep the very handsome orange kitty Gordo in your T’s and P’s. spending one night (awesome boondocking) in Nevada, and gathering supplies in St. George, Utah (loved Harmon’s for groceries). Cold weather would be coming later in the week and we wanted to enjoy Zion before it hit. Perusing the information about hikes, we set our sights on Angel’s Landing – a difficult hike but lauded as one of THE very best day hikes in all the southwest. Why? It starts with the West Rim Trail, about 2 miles up a steep hill, then the special part: the Angel’s Landing Trail, a 1/2 mile hike across a narrow rock ridge – also called a fin – with steep drop offs on either side. Chains are installed to aid hikers along the narrowest and steepest parts of the trail. No one has died on it in the last five years or so. Who wouldn’t want to hike this? I paid careful attention to the warnings provided by the Park Service and even searched the internet for others. How could a hike that was so perilous also be so popular? Some warnings stuck with me – from the Salt Lake Tribune for example: if you can’t get your footing without the chains, you might not want to hike it. There have been a half dozen or so deaths in the past decade, and the Park Service does not hide that fact, but rather uses it to discourage people. But A LOT of people do this hike. We figured we could too. One of the signs the Park Service has posted – very well written I think! The initial climb up West Rim Trail took us about two hours, just as predicted. We stopped to rest a bit along the way. Though it was December, the conditions were perfect – sunny, no moisture on the trail at all. We maybe saw 10 or so other people going up or down, and 1/2 dozen Park maintenance crew members shoring up the trail at its edges. Looking back down after we’d ascended the West Rim Trail, but before beginning the scary last half-mile. This first section of the hike ends with “Walters Wiggles” (better pic here), a set of 21 switch backs to take you up a very steep part of the trail before the most daunting stretch begins. Apparently they are named for the first superintendent of Zion who designed them! The first section builds confidence – it’s steep and narrow in places, but without the sheer drop off inches away. Fairly soon though, I arrived at a critical juncture when I saw what looked like a very, very, narrow tightrope-size ledge strung between the rock outcropping I was on and the one I wanted to get to. It scared me. I felt physically woozy in my gut. How was I to go over that, knowing I’d only have to go over it again on the return? And, to add to my fears, I couldn’t see or plan for what to expect on the rest of the Angel’s Landing trail ahead, so I couldn’t know if I was expending the appropriate amount of courage at this juncture, or if I should save some because I’d need even more along the way. A true dilemma, with not a little pride at stake. 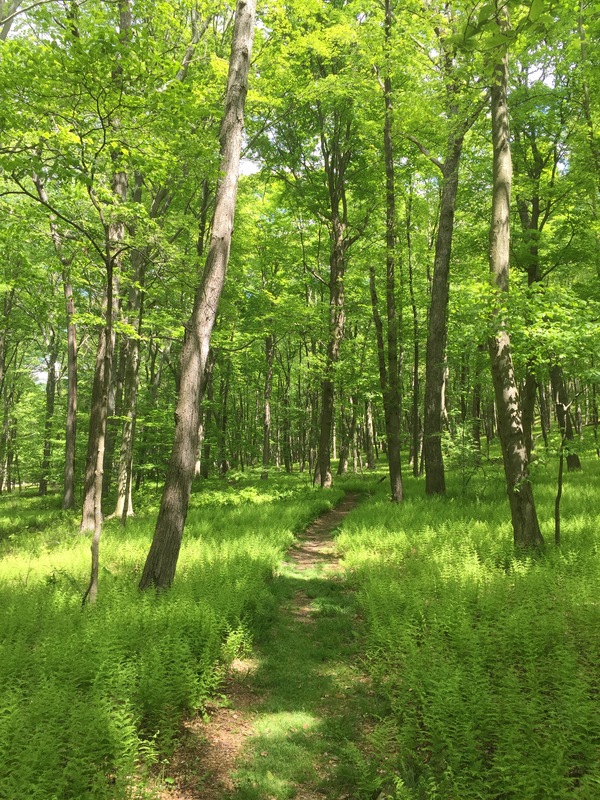 About this time, an older couple appeared, descending the trail and coming toward me – clearly reading my mind. They offered, more off-hand than directly to me – “Oh it’s easier coming down than going up” and “You’ll be glad you did it”. 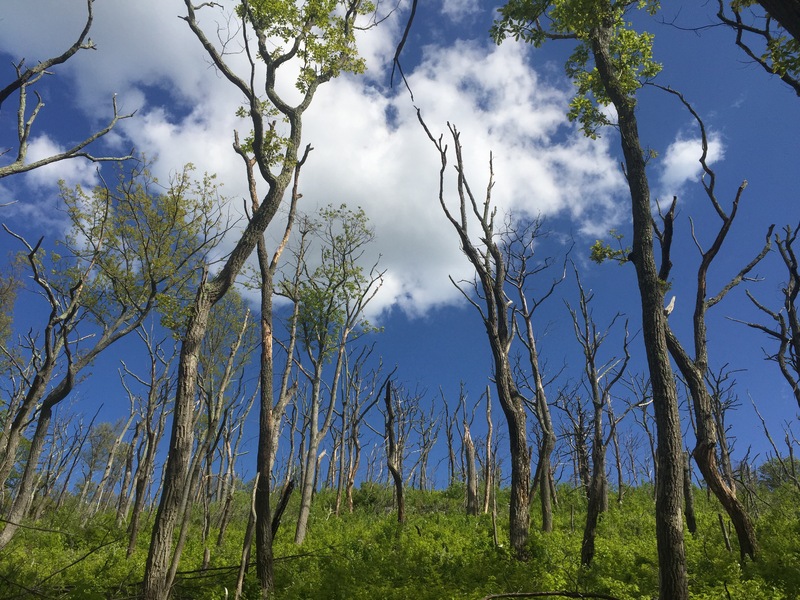 Somehow their words helped, and I am not ashamed to say so did the fact that they were older (most of the other hikers we’d seen were millennials practically running up and down the mountain in toe shoes.) I forged ahead. This isn’t the site of my point of no return ruminations, but it looks a lot like it. Ben is pointing toward the trail. Each 100 feet or so is a different challenge – pulling your self up, along side, against [insert preposition here] a rock face, with sure death in the form of a 1,000+ foot drop just inches or less away. It’s not hard to imagine how you could fall – it was more a matter of when. We were lucky there weren’t more people around – in the summer the path is crowded, and all those people make the trail more perilous. For example, when two or more are holding (and moving) the same stretch of chain, or one is going up while another is going down. (When in doubt on a narrow rock face , go for the hug). Success is found in hopefully a shared belief in the preciousness of life, and a collective fervent but tenuous grasp on it while together on Angel’s Landing. (For the most part people were very well behaved, though we did pass a couple in some kind of argument – lips pursed, eyes stony, heavy sighing, the whole nine, somewhere midway-ish near the tree pictured below. Triumphant selfie, reunited about about midway. Mostly Ben hiked ahead of me and I took it nice and slow. At another more treacherous point somewhere in the middle, I did gather myself a bit to at least appreciate the fact that while I was “in the moment”, I wasn’t appreciating the views. But the trail was so narrow here, I didn’t dare turn my head, and risk losing balance. So I literally raised my right and left arms just high and quick enough to take a shot of whatever it was I was missing, so I (and you) could see it later. Finally we reached the end, a fairly wide rocky plateau with plenty of places to sit and rest and relax and eat lunch, reflecting on accomplishment, scouting for angels. We saw one reincarnated as a chipmunk who persistently hovered trying to catch our crumbs. Should we have lunch here? Indeed the trail back was easier, but maybe only because we knew what to expect. As you can see in the pics below, those chains were put to good use by me and my bad knees. For Ben the way down, like the way up, was more of a walk in a park. Hands in pockets, shades drawn. Movie star cool. Of course we made it. I had conquered the fears that had cropped up, it had been thrilling, and I was glad to say I had done it. Though Ben thought this image of a hiker tumbling looked awfully similar to how I had deliberately approached the descent. And finally, nothing says “I defied death and conquered my fears” better than having happy hour outside on the “patio” in December. This one included our very first (in four months on the road) campfire. Cold, but very much in our comfort zone. We arrived in Joshua Tree squeaky clean – after spending Thanksgiving at home in Glendale, where we took the time to make a few tweaks, tackle some fixes and a conduct a general “clean up” (of us and the rig). The drive to Joshua Tree was a little over two hours and if you are coming from LA, either the West or North entrances will do. Joshua Tree is small enough (relative to some other NPs) that it’s worth trying drive through and hit all its corners as you plan your itinerary. We believe we found the best site ever in Jumbo Rocks campground: #77. With an unobstructed vista of rocks and sand and desert scrub, and of course Joshua Trees. Many of the sites there are tent-sized only, which leads to a good mix of tent campers and RVs (alas they do allow generators here at fixed times). As the sun was setting we took a walk. Ben and I passed the camera back and forth seeing who could take the best pictures. They are all winners, don’t you think? Dinner was all the food I had bought intending to cook while at my parents, but didn’t. You see, if I left it there, my parents wouldn’t eat it. You know? Salmon, collards, rice and sweet potatoes. Mostly from Trader Joe’s, which, if I had to choose only one place to shop for Airstream cooking, would be the winner. Thank you mom and dad for stocking our fridge. We watched the Caine Mutiny b/c some scenes were filmed in Yosemite. (Make no mistake, there is no cell service in JT, but we had downloaded it at my parents’ over the weekend.) It was a brief (and corny) scene but otherwise good movie. Got us thinking that would be a fun theme to follow – other movies filmed in National Parks. Any recommendations? We woke to another sunny temperate day in California – but the first we’d had camping in several weeks! There is really nothing better. Here I am breakfasting outdoors – something we haven’t done in a while. Our breakfasts can get pretty routine, but I love them all: it’s either cereal, oatmeal or eggs. This must have been a cereal or oatmeal day. The only downside is Ben and I have to eat the same thing – due to just wanting to avoid two people in the kitchen, extra dishes, etc. Oh, what we give up to go on a once in a lifetime cross country trip! We bopped over from the east side of the park to the West Entrance Station visitor’s center, which was small but staffed with super helpful rangers. They also had one of the coolest exhibits I have ever scene – a look inside the creative process behind the design of park PSAs. The PSAs were meant to promote appropriate park behavior to various types of visitors – the ad below is a mock up of the one aimed at campers. The “behind the scenes” revealed the editors wanted to be sure to pick a picture that included a tent and an rv/trailer. I don’t know how well this translates, but the English teacher in me just loved it and hats off to the staff for sharing it. Compare the draft up top (with editor’s notes) to the more final version below it. After consulting with a ranger, we set a course to do several short hikes as we crossed the park from the West Entrance, past our campground, toward the south entrance. If fact, you may want to start calling us “Short Hike Barkers on Break,” we did so many. Feel free to follow along (from left to right) on the map below. First up, Hidden Valley. As the name suggests this expanse is hidden behind a ring of boulders. Rumor has it (not much confirmed historical fact in the stories here, but they are upfront about it!) cattle rustlers used to hide out here with their loot. Can you spot Ben hiding in the valley? It was a clear day for the next stop, a drive up Keys View. You can see Palm Springs and the whole Coachella Valley, and the Sultan Sea. Mexico too, they say, but hard to tell. Somewhere down there the San Andreas fault is biding its time. We ate our lunch on a bench overlooking the view. Moving east, we hadn’t really planned on stopping at Ryan Ranch, but the adobe remains can be seen from the road and called to us. Much graffiti and ranch “trash.” Climbers too. Enjoy my artsy pics. Next stop the Ryan Mountain trail head , not to hike the mountain (a “challenging” hike) but to see Indian Cave – not much of a trail but a cool rock that has campfire smoke from who knows how many eons of campfires. We met Hash the van-cat there as well. He reminde d us of one of our cats, Gordo (who’s orange too). They were super hip, so we felt hip too. Not so hip to live with a cat in van though. Don’t worry, the windows were cracked and the temps mild. Shortly after this pic, he headed into the back for a nap while his owners hiked. Moving east, Live Oak picnic site doesn’t advertise it-but if you drive a bit beyond the picnic tables on the dirt road you can see the growing, healthy live oak (below) for which the site is named. We hiked beyond it on a pseudo-trail and really enjoyed the views and the solitude and the ROCKS. If these pictures don’t convince you to sign our petition to rename this park “Joshua Trees and Rocks” then you are missing the big picture. Finally, timed for sunset, a bit toward the South Entrance, we visited the Cholla Cactus Garden. You can really see the terrain change on this drive. It’s not gradual. It’s abrupt. And the cacti literally glowed in the sunset while the views of now the Colorado (as opposed to the Mojave) desert mountains were lovely. The next day we had a lazy-ish morning – Ben hiked around and I did yoga in the sand outside the trailer. I’ve done this a few times now – yoga outside is the bomb; yoga to combat aging muscles that spend a lot of time in the car is the bomb de bomb. From our campground, we hiked to Skull Rock – a popular spot, and sure enough someone offered to take our picture. See how relaxed I am from yoga? You’ll note I am holding my newly re-acquired fanny pack, which, unlike all my jacket pockets, is indeed big enough to hold my phone. It’s getting deployed a lot now. We had signed up for the afternoon tour of the Keys Ranch. The Ranch sory was interesting enough, but I found the site just very visually striking – these dark strokes of lumber and piping and machines against the Joshua Tree browns and sands and blue sky etc. And though any kind of private tour seems at odds with the concept of a National Park, it did feel special to be there, and as though the Keys family had just up and left in a hurry, and here we were sneaking a peek. No neat and tidy site is this – it’s the sort of place they’d love to find on American Pickers. Junk everywhere. And the life story of the Keys family isn’t tidy either – for example when asked what Mr. Keys’ profession was, the guide replied “A little bit of everything” which is what it took to survive in the desert. Mr. Keys – actually ended up serving a sentence in Alcatraz – I won’t spoil it by saying what it was for (think Wild West). The oldest Keys son visited the site regularly until he died just this year. He will be interred at the family plot still on site. 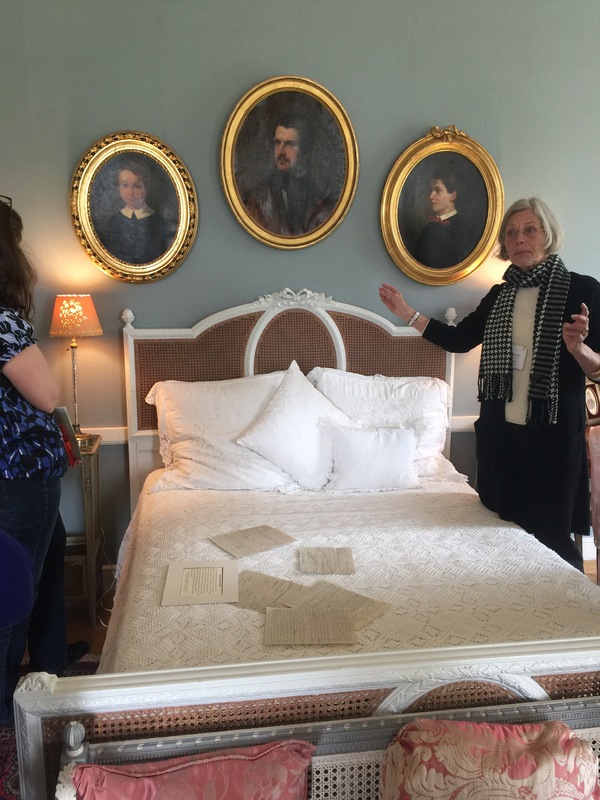 The tour cost 10 dollars, and is only offered three days a week, though they are popular enough that they will be adding some more. I imagine it’s a struggle for the hardworking public servants at NPS to have to limit access to such a cool part of the park. The rangers have access to a Library/Archives onsite to help them research and show “past and present” like with this old photo of an area of the ranch. Afterward, we had time for one final short hike – Barker Dam of course. It hadn’t been heralded in any of the hike guides we perused, but of course we had to go. And it was fantastic! Again, maybe b/c of the time of day. It was flat, with rolling hills and the most incredible site in the middle – a dam that was built and rebuilt by ranchers who lived and grew live things here in the desert! More pictures from Barker Dam…. Joshua Tree was a great way to launch our time in the southwest. And, though doing a bunch of small hikes and seeing more doesn’t always feel like the right approach, it worked very well for us at this park. Like the Joshua Tree itself, we avoided establishing deep roots in any one part of the park, and instead attempted to absorb as much as possible through a broader approach. After 11 weeks on the road, we pulled into my parents’ SoCal driveway with a medium size list of things to fix, tweak, switch out or alter. Here is the list, the first few in order of importance/annoyance; the rest are a bit “in the weeds” but we include in case those undergoing a restoration can learn from our experience! 1.Trailer brake lights. In Oregon, we had a “sudden stop behind a semi on the highway don’t know if we are gonna make it” scare, which made us think hard about how well the folks behind us could see our brake lights, especially obscured by the bikes. Ben wanted lights that would somehow blend in and found these bright LEDs to attach to the Airstream bumper. He spent a good amount of time making sure the install was clean, and of course, functional! 2. Closet renovation. At first we had a small closet with a hanging rod and one of those hanging sweater things. The “sweaters” always fell out, and of course we just don’t have a lot of clothes to hang. We do have clothes to roll up, stuff, and most importantly to store in a sort of purgatory when we are planning to wear them the next day. Hence the new closet with shelves only. We’ll get it a bit more organized, but as a quick fix I made a couple of “drawers” out of cardboard boxes, covered them with contact paper and made rope handles. It’s working out great! The purgatory “bins” are the bottom row – Ben added that wood divider at the last minute so we’d each have our own side. Good idea. 3. Curtain tabs instead of metal hooks. I made the curtains and I guess to save a little time/labor I attached them to the rods with metal hooks. Boy were those a pain. They were hard to open, close, the hooks were always coming off and when we drove, the rods would often fall off. I retrofitted them by sewing on tabs (much harder to do on a machine after the fact) and they are working like a dream now. 4. 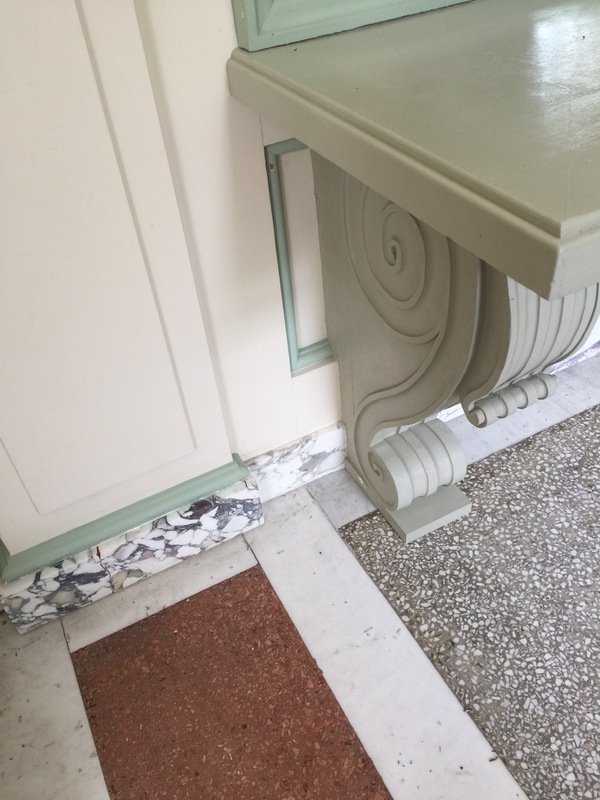 Woodwork – a few things that a little woodworking helped to make better. Clockwise from left: a “dam” to block errant water flow in the shower (the eucalyptus is new too! ); Ben fitting and making fiddle rails for the dinette/bed cushions; and a little platform to raise our pantry cabinet so the door opens / closes more smoothly – it had dragged a bit on the floor before. 5. A little metal work – hanging, bolting, etc. which really all come down to creating more/better storage. Left to right: Some new hooks in the shower to hang our dirty laundry bags. Also in the bathroom – Ikea had these nifty metal shelves and one is up now to hold my main toiletries bag to make more room on the counter top. Finally, we already had the bread box, but now it’s bolted down! 6. Trailer hitch The paint on the weight distribution bars had been coming off and there was some surface rust. Ben scraped the old paint off, sanded and repainted with POR 15. It’s a Reese hitch system which we are loving overall, but we were surprised the paint deteriorated so quickly. 8. Polish And finally – in my mind we were only going to do it if we had time – in Ben’s it was gonna get done no matter what: a quick and dirty polish using S-grade Nuvite polish and the cyclo polisher. The truck got a nice washing as well. 9. Jettisoning some stuff So, our truck bed was crammed full, and we did some hard sorting and left behind stuff we hadn’t used and came to realize we likely wouldn’t miss: a foldable kayak and accessories, a metal detector, sewing machine, exercise bands (kept the yoga mat), some clothes (see pile below; but added my slippers, which I had foolishly thought I wouldn’t want), our tent (kept the sleeping bags). 10. Storage Hammock Where to store produce that doesn’t need to be refrigerated? We had tried everything and we bought and installed this gear hammock (from a marine store of course). It was hard to pick a practical spot that wouldn’t stick out too much – we settled for above the sink. So, off we go, 2nd leg, Southwest here we come, on our way to Ben’s family in Dallas for Christmas, with hopefully a shorter refit list so we can enjoy family and put the rest of our time and energy into rooting for the Sooners (Ben’s alma mater) in the playoffs! We got two very good pieces of advice before heading to Yosemite, both from friends who we had visited in the Bay Area the previous weekend. One piece of advice was more practical, the other more, shall we say, spiritual. The were both key to to a great, great visit to this gorgeous National Park. Spoiler alert: Yosemite is A-MAZING! The first piece of advice was about winter access. Yosemite is in the Sierras. It snows there. If it snows, the park will be open, but you might not be able to get there with your Airstream trailer unless you have chains for your tires. They are very strict, gentle but firm about this. It is in fact the law. You can buy chains (which we didn’t want to do) or you can hope the warming trend coinciding with your itinerary will yield an upgrade of road conditions, allowing you to enter the park without chains. How will you know if the road conditions change? Call this number: 209-372-0200. Some talented park ranger has to do a new recording every time road conditions change – on the first night of our campground reservations (a Tuesday), the conditions were still “R3” closed to neophytes like us, people driving cars without chains. So, like the pioneers when they faced similar challenges, we bided our time at a lovely winery. This Harvest Host, Vista Ranch & Cellars in Merced was perfectly situated just a few hours west of the park. In fact Merced was a jumping off point for tourist trips to Yosemite back in the day, and even today, those without a car (or chains) can take a bus from there, or even as far away as the Bay area. The next day, Wednesday, temperatures were up, that snow was surely melting, and in fact when we called the road conditions line, all had been upgraded to “R2”! You would only need chains IF you didn’t have four wheel drive (we did) and M + S tires (we did). Even still, when we arrived at the west entrance from 140, the so very helpful and sympathetic NPS staff at the gate (clearly reading off a checklist or some sort of matrix) told us that b/c our trailer had its own set of brakes, we would still need chains. Harrumph. However, a ranger was quick to help us come up with a plan B: book a night at Indian Flat RV Park, about 8 miles down the road, unhitch and head into the park for the afternoon with just the truck. And, assuming all continued to improve, we’d surely be able to get in with the trailer the next day (Thursday). As with the 99% of other times when Plan A has failed, Plan B turns out to be as good or better. Because look who we got to meet at the Indian Cove RV Park? Tigger, the RV park cat. We quickly unhitched and headed back to the park – we felt like we had been sprung from prison, FREE, as we rolled by the entrance gate, approved to enter with only our 4 wheel drive and M + S tires. We were free to explore for the few hours of daylight left. Though I grew up in So Cal, I had never been to Yosemite. I had some sense of what to expect, but was not prepared for the scale of the mountains, their pure granite beauty, and of course the stunning minute by minute changes the rising and setting sun casts on them. Plus there was snow! Melting and slushy mostly, but quite icy in spots too. Happy tourist below – first time in Yosemite. Yosemite Valley is more or less a loop road – with free park buses that run a continuous loop to all the major sights and trailheads, so once you are in, you are encouraged to park your car and walk, bike or hop on the bus. 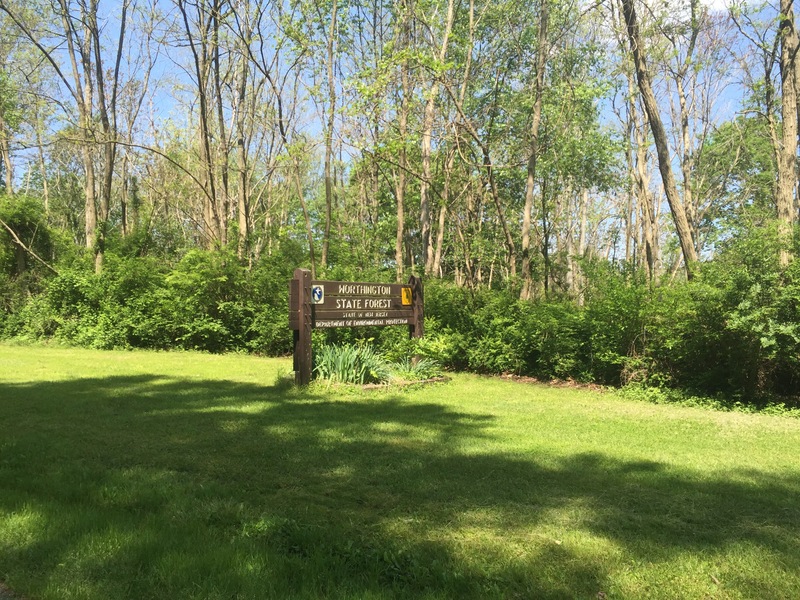 Most trailheads, and even the Visitors Center don’t have parking lots. It took us this afternoon to figure this out. But first, we made our way to the Pines Campgrounds, where our reservations, you may recall, had begun the night before. Despite the prominent signage saying “no refunds”, the ranger there was more than helpful in refunding the night we missed, and moving our reservations forward another day. It never hurts to ask. We stopped in the Visitors Center to do a quick perusal – watched one of the movies and came out to a completely altered night sky. Is this what it’s like every night? Wow. Back at Indian Flat RV Park, we rested up and hoped for the best on road conditions the next day. In the morning (Thursday), as we prepared to drop our quarters in the pay phone to find out, Ben ran into one of the rangers who helped us the day before – he came by on his way into work to tell us that indeed, they had changed the conditions yesterday. We were “R1” and good to go. How is that for customer service? Off season camping rocks. After pulling in to spot 151 in a nearly empty Upper Pines campground, we immediately set out on the Mirror Lake trail. Recommended by more than one ranger as a good “warm up” hike and one that would not be too icy. Nothing like snow to help you track the wildlife! Very suspicious. Seen near the dumpster in our campsite. Note, there appears to be a Mirror Lake photo op, where you can hop off the bus, walk a few hundred yards to the Lake and move on. However the trail is longer, more meandering, a true suspense builder as you go. But wait, here is where the 2nd piece of advice we received kicks in: from my friend Joan’s book shelf, she kindly let me borrow “Yosemite Valley: Secret Places & Magic Moments” by Phil Arnot. In his Introduction, he lays out some general tips for experiencing the park as more than just a tourist. One that we took to heart was to agree not to talk to one another for certain time periods. “Conversation is distracting,” Arnot explains. In order to have an in-depth experience of the Valley, silence and solitude are key. Now, Ben and I have had some really great conversations on some of our longer hikes on the trip so far, and I realized those conversations were in part borne of the time alone, the quiet, the serenity of the natural environment, the meditative quality of one foot in front of the other on the trail. It really did make me realize how much that same environment can encourage similar results, but within yourself. We were both game to try it and the Mirror Lake trail was perfect for it because there was tons to look at, the landscape was slowly but continuously changing. Most of the first part of the trail was densely wooded alongside a river. Then it opened up into more of an open field (many trees had been toppled) and clear views of those granite mountains. Incredible! Because we had been quiet, I really noticed more. The mix of fall (leaves turning, browns and golds) and winter (icy snow, bare tree) struck me as well. We crossed the river and came back on the other side. It was about a five mile hike and we were wiped, and it was getting late, toward sunset, and we wanted to squeeze in one more activity. We hopped on the b us and got off at the Yosemite Lodge (for hot chocolate) and walked to the Yosemite Falls foot bridge. It was nearly deserted, and though the iPhone pics don’t do it justice, a lovely way to see the falls. On the bus again, we got off at our campground stop and the driver called out to make sure we had a flashlight. We did, thanks to Ben thinking ahead but still bumped around a bit among the loops to find our site. The next day we set out to do a more challenging hike – Vernal Falls. We could walk to the trail head from our site and checked out the Mist Trail on the way- which I understand is packed during high season and was now completely empty. The trail to the Falls was quite icy in spots. We hiked alongside a group of 8th graders and figured if they could do it, so could we! The elevation gains were gradual enough so it wasn’t just a slog, and the views changed incrementally providing something new to look at at every switch back. Again, pictures don’t do it justice. Once we got to the falls, we were up for going a bit further so continued on toward Nevada Falls. We got just to Clark Point and the road closed signs were enough for us to call it quits there. Many other hikers, mostly fellows on their own, hopped the fence and kept going (they had better equipment) but so did a group of three women in their 50s from Korea – one of whom lives near Yosemite now and comes every few weeks to hike. After hiking down, we explored Curry Village a bit. We saw dozens of people arriving to check in for the weekend. I bought some new sunglasses (I lost mine on the Mirror Lake trail but never noticed it – all that introspection can have its downside) and we found out we could NOT make a last minute dinner reservation at the Ahwahnee for dinner – the super fancy lodge dining option. Probably best as I am not sure what kind of outfit I could have scraped together. We ate at their bar instead – it was nice to get out for the evening, but I would not recommend it – sort of like eating at a chain hotel restaurant, but worse. Sorry to end on this negative note, but gotta keep it real. We don’t know what to do with this. campers who arrived from the Bay Area sometime around 130) the firewood that had been gifted anonymously to us when we arrived (we have yet to have a single campfire) and headed out to make our way to LA for Thanksgiving. We took with us a fair amount of Yosemite mud on our hiking boots, and smiles for all the arriving weekend visitors who’d enjoy unrestricted access to the park roads and perhaps a few less road closed signs on the trails as the temps remained moderate for another off season weekend. We have gone up, down, around, and through Oregon on this trip. 10 days on our swing north in September (read about some of that here, here, and here, another 10 days on our swing back south in November. Though, embarrassingly, I included the first night of this second leg in Oregon in a post about Washington state. Sorry The Dalles! Having visited Portland, Willamette Valley, and some of the coast about 10 years ago, we were pumped to revisit some of our favorites and find some new places to explore as well. We’d been to Astoria before – a neat, real (not just a tourist) town on the coast, at the mouth of the Columbia River. Astoria welcomed us back with a beautiful rainbow! We stayed in Ft. Stevens State Park – and got lost looking for the campground, but as usually happens once you get past your annoyance at the GPS, our wrong turn led us to some beautiful sites and we took a walk around the jetty. The main thing we wanted to do this go round in Astoria was visit the Ft. Clatsop National Historic Park, where Lewis & Clark wintered over after completing their westward journey. The Corps of Discovery did not enjoy their time there — it rained a bunch — but we did especially because the park had been closed due to a fire when we here 10 years ago. We don’t have any pictures (!) but we do have this video we made there because our visit coincided with our nephew Carter’s birthday. It also just goes to show if you didn’t get that card in the mail on time, with a little creativity and the wonders of technology, you can do something cool to make up for it. 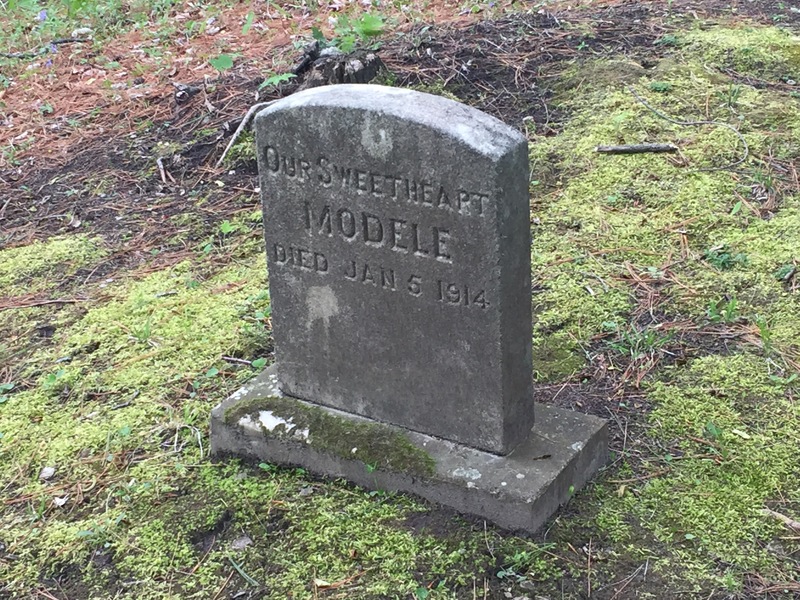 We rode our bikes to Ft. Clatsop – it was a little further than I thought it would be, on some busy roads too, but I would still recommend it. I don’t know if this is novel to anyone, but when I am low on batteries or data or coverage, I take a screen grab of my route and refer to that as I am able. The museum and site were very good. The replica fort (seen behind us in the video) was smaller than I thought it would be – you get a real sense of the Corps just hoping to – I dunno – maybe stay warmer by being so close together? Having less of an area to defend in case of an attack? I appreciated the attention to the long term fate of each Discovery Member in the exhibits, especially York. In the evening we treated ourselves to dinner at the the Bridgewater Bistro in Astoria. The food was only pretty good, but because the service and the setting were so spectacular, we’d recommend it. They let us combine two desserts into one – a chocolate brownie with coconut ice cream. And the crab cheesecake appetizer was excellent. On the way out of town, I stopped in the small but lovely Astoria Co-op, while Ben waited in a very long line to get his haircut at the Eleventh Street Barber. He passed the time by chatting it up with some local Coast Guard fellows, and I was amused by the proprietor who kept offering everyone cold beer from the mini fridge. After a quick trip back to Seattle for some “admin” and a chance to visit dear friends in Auburn, we spent one more night in Washington – at an Airstream park, the aptly named Washington Land Yacht Harbor. The Park was pretty basic and they’ve opened it up to non Airstreamers (but if you are WBCCI members, there is a discount). 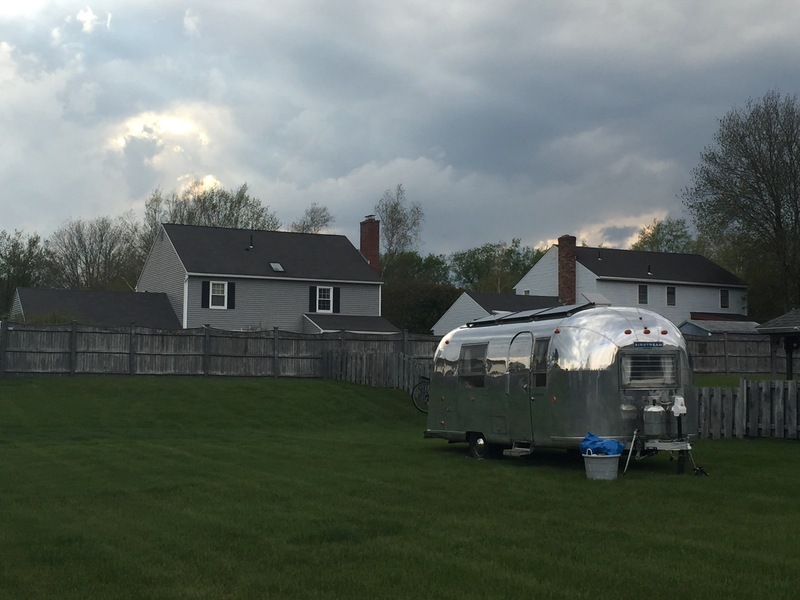 There is also a fairly large brick and mortar home community surrounding the park – only requirement is that you must own an Airstream to buy a home there. We chatted a bit with one of the residents about the history of the park — folks with a common interest coming together to build a community — and the ways they are working to keep it going today. We made a quick stop at the Olympia Farmers Market (get the cinnamon bread from Wagner’s and any jam from Johnson’s Berry Farm) and the state capitol (pics below) before we recrossed the border. After an afternoon of chatting and catching up we had a great dinner out – we wanted to go somewhere “Portland” and we knew Julia picked a good restaurant when the waiter assured us their pork come from pigs that are “pumpkin fed”. I couldn’t remember the name of the restaurant but just found it by googling all the things from their eclectic menu that I especially liked: “short rib sushi bread pudding” – and it was the first hit! Pono Farm Soul Kitchen in Northeast Portland. Yum. We had a fortuitous meeting in Tom’s kitchen the next morning over coffee and cinnamon bread – his friend Stuart came by and once we realized he was a guru on Oregon travel, we asked and he gave us all kinds of tips on where to go, in what order, via what road, down to which Dairy Queen was the best in the state and how to work in a side trip to the town where some of Animal House was filmed. Not only that – he told us his mother grew up on a farm near Eugene, his sister lived there now, and would we like to park the Airstream there? Yes! Following Stuart’s tips, we headed south to Willamette Valley, via Oregon City, the final stop on the Oregon Trail. The VC there is a bit pricey, and at this point we maybe felt a bit overloaded from other related sites we had visited but it provided nice closure to that theme of our travels and a good photo op or two. Exterior of the museum depicts – a wagon! We headed south into Willamette Valley, to our Harvest Hosts Kramer Vineyards near Gaston. Though they were having an event that night – they couldn’t have been nicer and more accommodating to make room for us. We arrived just in time to jump in for the heritage vertical pinot noir tasting – basically tasting the same vintage, but from six different harvest years. Their thoughtful placemats (below) explained some of the differences in the rainfall, temperature, harvest date, yield, etc of each year. The owners encouraged us to sip, take notes, let the wine breath some more, repeat. It was awesome – I appreciate good teaching and this was it! We were seated with this really nice couple who are wine club members there and were so generous as to cover our tasting bill as part of their guest allowance. I know this is not exactly like the kind of generosity Cheryl Strayed writes about receiving on the PCT when her 20 dollars didn’t arrive and she wanted a Snapple, but we were very appreciative nonetheless! We even bought some Pinot Gris to go – in a growler! – so though the wine is gone, we have a very nice souvenir of this visit. On the way south, we stopped to do the Cape Trail at Cape Lookout State Park. This trail is truly fantastic – gets you out, as the name suggests, on a cape, with gorgeous views of the Oregon Coast. The hike was fairly flat but with some difficult passages due to mud, rain, general dampness that was the weather for much of this leg of the trip. But fantastic hike – highly recommended for coast lovers. Before the trip, I had surgery to repair an ankle ligament tear and I take pictures like that in the lower right to send to my surgeon some day as a thank you. On to Newport, where an excellent Wheelingit blog post about free or cheap(er) camping on the Oregon Coast led us to the Port of Newport Marina. We always enjoy a marina, though the dry site parking area was adjacent to the Rogue Brewery warehouse and a few semis kept their engines running while resting there at all hours. But the view (below) couldn’t be beat. Yaquina Bay Bridge just south of Newport, OR, in our dry camping spot at Port of Newport Marina. We walked a hundred yards to have dinner at the Rogue Brewery Pub that night – the food was excellent! Try the crab kimchi sliders appetizer for sure. The next morning we walked a few hundred yards and forked over the big bucks to explore the Oregon Coast Aquarium – click on the link to see the best URL ever. We don’t begrudge museums entry fees, but it always feels a bit of a risk. In this case, it was well worth it. The Aquarium has more than a little bit of everything including live animal feeding demos, a walk through a shark aquarium tunnel, and thoughtful exhibits with volunteers and staff who were very good at their jobs answering questions, sharing what they knew and passing on a respect for the natural world. This volunteer with the puffins was so knowledgeable and knew just how to engage her audiences. The pelican exhibit stage had recently been enlarged so the staff are painstakingly familiarizing the animals with the new space. 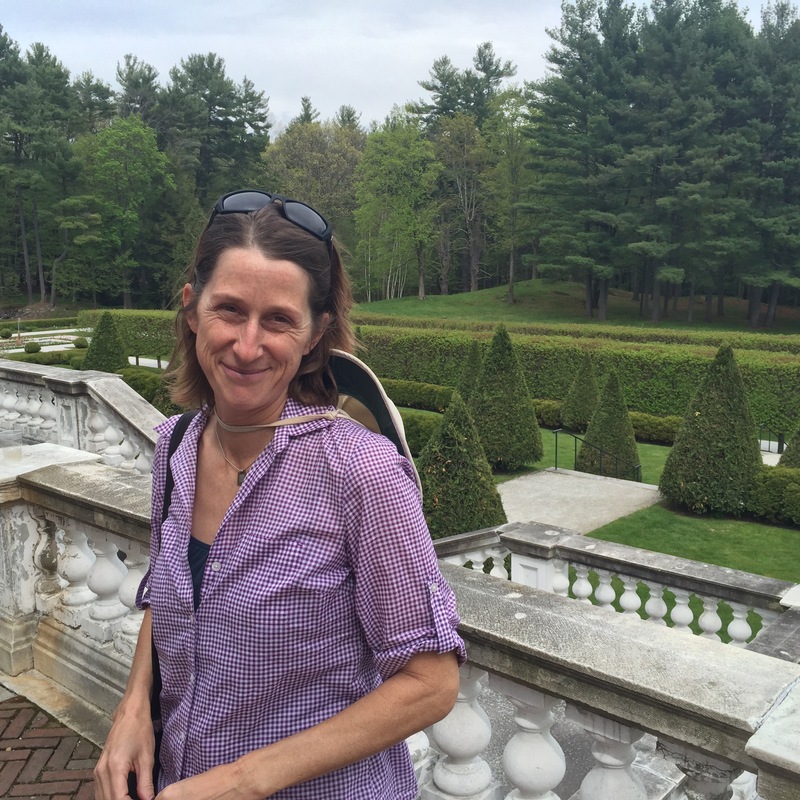 We headed east to Stuart’s sister’s house – the Hurd family farm. The barn – 100 years old–was an awesome setting and we enjoyed our neighbors, sheep, chickens and rooster. The next day, I headed into Eugene. It’s always fun to check out a big college campus and University of Oregon was lovely. I checked out Hayward Field – home to track and field legends – and their art museum, which had a cool exhibit on post war Japanese prints. 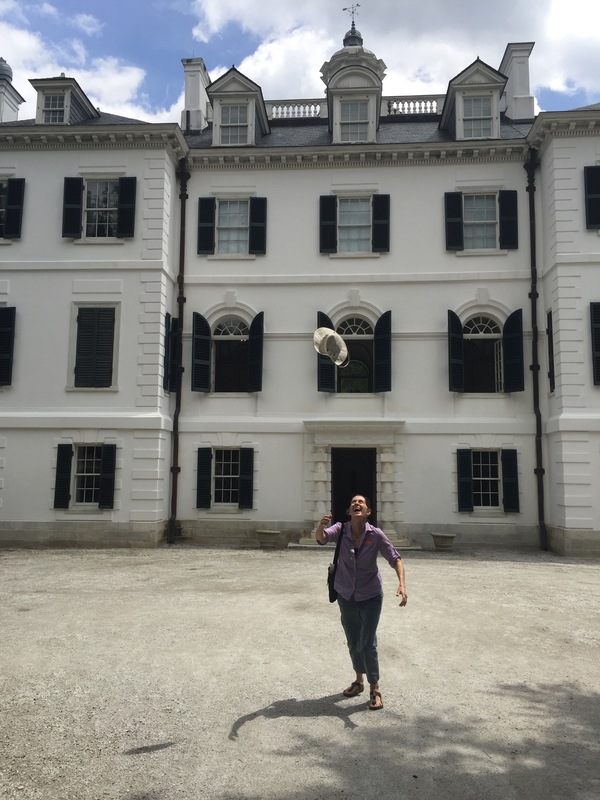 As I walked across the same type of criss-cross quads I traversed as an undergrad, I caught snippets of conversations among the students – worries about how to bring up a grade (this from someone on a cell phone), wishes to check out new restaurants (or food trucks), a mission to return some rain boots. Though so much has changed, so much is the same. We finished off the state with a visit to Ashland, home of the Shakespeare Festival for most of the year, but not this month. I did a quick hit of their downtown to do a little shopping of my own, of course visit their very large and very good Ashland Co-op and scout out restaurants for before a concert we were heading to that night. As we winded down this first leg of our trip, it seemed we still had some work to do to check out the night life / cultural events in the places we visited. This (left) folks/bluegrass/orchestral mix of groups was right up our alley. They even had a hammer dulcimer! One of the leads, Emy Phelps, is from Ashland, so it was a homecoming event for her. A highlight was when they brought all the local (about 20 kids) young violin students up on stage with them to join in for one of Emy’s songs. The parents especially loved that because all those hardworking novices sounded so good in harmony with the professionals. The whole vibe was about collaboration and education, a mix of young and older, lots of smiles and great music! Culture and nightlife – check! I’ll end with a scary story (with a happy ending) and a cautionary tale. On our drive to Astoria on I-84, we encountered what was without a doubt the scariest moment driving and the closest we’ve come to an (what would have been awful) accident. We are cruising along in the slow lane, and the first we saw anything, the semi in front of us came to a screeching halt and Ben reacted, braking hard, slowing us down, with one hand protectively on me (I think he was trying to keep me from screaming as much as from slamming into the dash) as he very very calmly and slowly said, “OK, I am not sure we are going to stop in time.” Yikes. Hold on, hold your breath and watch the road between you and the 18 wheeler in front of you slowly disappear. As Ben looked left, trying urgently – without success for a long minute or two- to look for a spot to merge into the fast moving traffic and get moving, I leaned right and saw what was up: someone had been carrying a range stove in the back of a pick up and I guess it wasn’t fastened down well, because they were now moving the oven from the road, back to their truck. Oh my gosh. And still we were at a dead halt on a four lane highway. Once it was out of the road, the truck ahead of us quickly got going, and so did we, still worried about getting rear ended until we got some speed going. We thanked our lucky stars and made an appointment to get our brakes checked (though they got us out of this jam, just for peace of mind.) When I told my dad this story he asked if I got a picture of the oven in the road and I said – no, darn! – so I snapped this one (above, right) on the road a few weeks later…pretty well battened down, but not something we’d choose to drive behind. So – watch the road for flying appliances (you probably are already, though).